The Area Agency on Aging District 7 in Ohio was recently recognized at the national level by the National Association of Area Agencies on Aging (n4a) with an Achievement Award for successes with the AAA7’s Hospital2Home program. 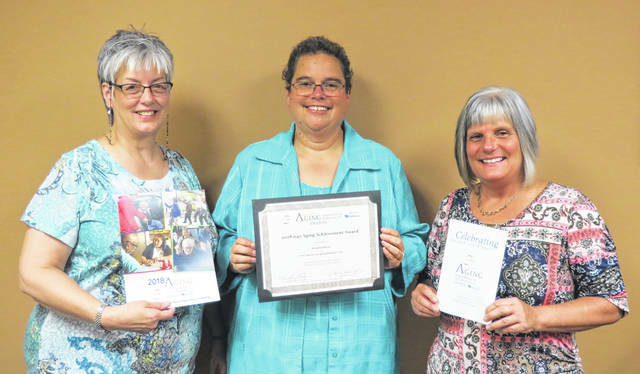 Pictured are AAA7 representatives Nina Keller, Assistant Director; Donna Hurt, Options Coordinator; and Vicky Abdella, Director of Community Programs. OHIO VALLEY — The Area Agency on Aging District 7 (AAA7) in Ohio was honored recently with an Aging Achievement Award by the National Association of Area Agencies on Aging (n4a). The awards program was supported by WellCare Health Plans. The AAA7 was among 45 local aging programs to receive honors at the n4a Annual Conference and Tradeshow that was recently held in Chicago. The AAA7 was recognized for achievements with their Hospital2Home program. “With the healthcare landscape changing at a rapid pace, our members continue to meet the needs of America’s rapidly growing older adult population by finding new ways to position themselves in the long-term and health care marketplaces while strengthening the services they already offer,” said n4a’s Chief Executive Officer Sandy Markwood. “Our members work tirelessly, with little fanfare in their communities, and this program enables us to shine a well-deserved spotlight on their critical work to support older adults’ health, safety, independence and dignity,” said Markwood. As the name indicates, the AAA7’s Hospital2Home program helps older adults in the AAA7’s 10-county district transition from the hospital to their homes. The program gives eligible patients vouchers for services like personal care and home-delivered meals. To determine those who could benefit from the program, hospital discharge planners and/or social workers identify recently admitted patients who are age 60 or older, not currently on Medicaid, and have a high risk of being readmitted to the hospital. Currently, the AAA7 is working with six hospitals in the district with the Hospital2Home program. In Hospital2Home’s first year, over a three month period, 89 percent of patients were not readmitted to the hospital and 80 percent reported that the services they received as a result of the Hospital2Home program helped their recovery process. The 2018 n4a Aging Achievement Awards honored traditional and new strategies in a range of categories including Advocacy, Agency Operations, Caregiving, Diversity and Cultural Competency, Elder Abuse Prevention, Health-LTSS Integration, Healthy Aging, Home and Community-Based Services, Information and Referral and Access to Services, Intergenerational Programs, Nutrition, Social Engagement, Technology, Transportation and Mobility, and Workforce Development. For more information about the Hospital2Home program through the Area Agency on Aging District 7, contact Vicky Abdella at 1-800-582-7277, extension 22254, or e-mail info@aaa7.org. The local Area Agency on Aging District 7, Inc. provides services on a non-discriminatory basis in 10 counties in southern Ohio including Adams, Brown, Gallia, Highland, Jackson, Lawrence, Pike, Ross, Scioto and Vinton. These services are available to help older adults and those with disabilities live safely and independently in their own homes through services paid for by Medicare, Medicaid, other federal and state resources, as well as private pay. The AAA7 Resource Center is also available to anyone in the community looking for information or assistance with long-term care options. Available Monday through Friday from 8 am until 4:30 pm, the resource center is a contact for learning more about options and what programs and services are available for assistance. Those interested in learning more can call toll-free at 1-800-582-7277 (TTY: 711). Here, individuals can speak directly with a specially-trained resource specialist who will assist them with information surrounding the programs and services that are available to best serve their needs. The agency also offers an in-home assessment at no cost for those who are interested in learning more. Information is also available at www.aaa7.org, or the agency can be contacted through e-mail at info@aaa7.org. The agency also has a Facebook page located at www.facebook.com/AreaAgencyOnAgingDistrict7.